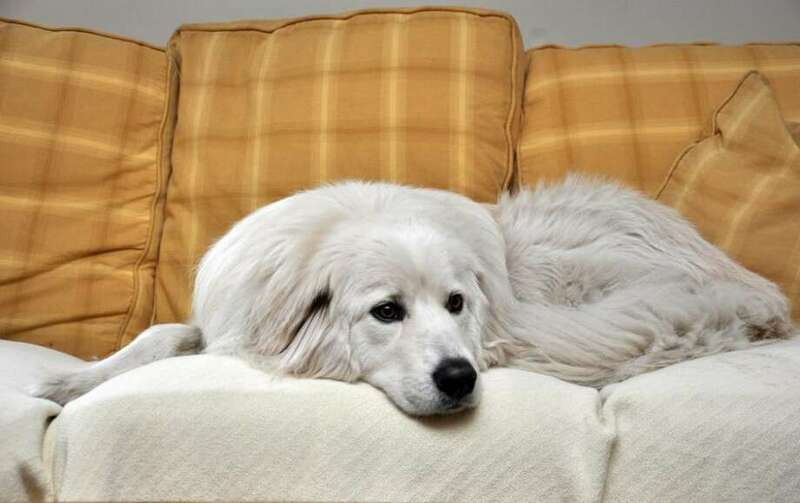 Hudson, a 3.5 year old great pyrenees, relaxes on the sofa in the Harding's living room on Sunday. They say that a dog is man's best friend, but in Luke Robinson's case, his dog Malcolm wasn't just a friend. He was family. In fact, Malcolm's death in 2006 inspired Robinson to set out on a more than 2,000-mile walk from Austin to Boston, the goal of which is to raise awareness about canine cancer. Before embarking on his journey, Robinson was making good money as a business consultant. The money didn't matter. He quit his job, sold his truck (something, he said, most Texas residents couldn't bear to do), put all of his belongings in storage and decided to enter a new phase of his life. Robinson isn't alone as he traverses America. He's walking with his other great pyrenees pooches, Hudson and Murphy. They've been on the road for 24 months and that 2-year milestone has them in Fairfield this week. Robinson has gotten publicity along the trip and Fairfield resident Karen Harding, who owns two golden retrievers, saw Robinson on "The Today Show" about a month ago. She then went to his Web site, got in touch with a volunteer who supports his cause, and said she and her husband David Harding -- who owns Daybreak Nurseries in Westport -- would be willing to host him at their home if he needed a place to stay. Robinson arrived at the Hardings' home on Saturday and will stay most of the week. Were there any reservations about having a stranger in their home, with their three young boys, even if he was a fellow dog owner? Not at all. "He was just so real and so genuine and doing it for such a good cause that we couldn't resist," Karen said. The Hardings know how Robinson must have felt when Malcolm died, because they lost two golden retrievers to cancer. The couple has shown Robinson all of the sights around Fairfield and Westport, and on Monday, when the Fairfield Citizen talked with Robinson, he was working for the day at Daybreak Nurseries, helping to clean up after the storm. Robinson said he has seen some beautiful town and cities on his trek, but he thinks this area of Fairfield County "takes the cake." "It's like a Norman Rockwell painting. It has a bucolic charm," said Robinson, who added that he could definitely see himself "growing old" around here. Robinson is ahead of schedule as far as reaching Boston, so he's had more time recently to stop and smell the roses, so to speak, to stay a little while in the towns and cities that he visits and take in the sights. On the east coast, he's visited, among other places, the Liberty Bell and the "Rocky" Statue in Philadelphia, and also Ground Zero in lower Manhattan. This 2,000-mile-plus journey has taken him everywhere from Beale Street in Memphis to walking across the Mississippi River. But everything along the way hasn't been peaches and cream. Unlike others that have done multi-state walks for charity, or to raise awareness about a certain cause, Robinson doesn't have a vehicle that follows him or a trailer he can sleep in between the 10-12 miles he'll often walk in a day. It is truly him, his dogs and about 100 pounds of supplies (including a tent), food and water that he carries on his person. "It's the real deal," said Robinson, who's come very close to being hit by cars numerous times and who was a short jog from a tornado in Texas, early into the journey. In July of last year, he was sleeping in his tent in Perryopolis, Pa., when a "lightning storm stalled right over us." The lightning, Robinson said, was splitting trees 20 to 30 feet from the tent. Robinson was making his way through Madison, Ind., on his way to Ohio, when a pack of dogs -- five rottweilers and a pitbull -- came running down a hill toward him and his dogs. Robinson thought he and one or both of his dogs might be killed. If not, he knew it was going to be a bloodbath. Robinson would have fought the unleashed dog pack to save his own dogs, but he didn't have to. While his initial instinct was to run, he realized if he did that, he would be looked at as prey by the dogs, so Robinson -- while the rottweilers and the pitbull were still some distance away -- bravely stood his ground, puffed up his chest and used one command -- "Git" -- yelling it at the top of his lungs. Robinson had bear mace on him but didn't want it to use it, as he loves dogs. "I've learned that you are your own best defense against attacks like that," he said. "It's posturing and vocalization." It wasn't easy, though. The first time Robinson yelled, the dogs stopped, but then charged again. Robinson would have to yell at least five more times to keep the dogs at bay. Since the dogs were coming from down a hill, they had a lot of ground to cover. Robinson said if it was a scenario in which the dogs showed up in front of him from around the corner, he and his dogs might not have been so lucky. Robinson said he's had about 20 to 30 encounters with dogs on his trip and noted that people in the south don't keep their dogs on leashes like they do in Fairfield County, and so, the individual dogs often form dog packs and develop a predator mentality. For the first year-and-a-half of Robinson's trip, he slept in his tent, often in state parks, according to Karen Harding. But as his journey became more publicized, more people began welcoming him into their homes, even giving him a spare set of house keys, or a spare set of car keys,when they had to go to work. They trust Robinson, but Robinson credits his dogs for much of the trust. "This would be an entirely different story if I wasn't walking with my two dogs," he said. "Most people have a respect for animals more so than people. I think when people see Hudson and Murphy, and see that they're well cared for, that gives them a window into my soul." But everyone hasn't welcomed him with open arms. Because he can't get to a shower all the time, and because his cheap razor doesn't work well on a beard that has grown out, he said he has been refused service at some restaurants. One waitress told him, he recalled, "We don't serve your kind here." In Fairfield County, Robinson said it seems like there's a convenience store or a pharmacy almost on every block, but back in some of the southern states, he would walk 20 to 30 miles without running into one. The most barren area he walked was the Delta in Arkansas. "The conditions there were so harsh. Temps were in the triple digits and there was 99 percent humidity," he said, adding, "deadly conditions for dogs." As such, the dogs stayed with a host family while Robinson walked the 140 to 150 miles or so from Little Rock, Ark., to Memphis, Tenn. There was one area Robinson and the dogs traversed that didn't involved walking -- the water between Connecticut's shoreline and the Long Island Sound. It was suggested it would better to take the ferry from Port Jefferson, N.Y., to Bridgeport than make his way through the Bronx and Route 1. Robinson will likely wrap up his journey through Connecticut in late April and has given himself a month to get through Rhode Island. After that, it's off to Boston, where he and others who have lost someone, or who have been touched by cancer, will gather for a memorial service at the Charles River Esplanade. From there, the group will walk a mile with Robinson and his dogs to the Boston Commons, the conclusion of the walk. Following the finish, there will be a celebration at the Fairmont Copley Plaza Hotel. Robinson plans to write not one, but two books about his experiences. He doesn't know where he'll live when the walk wraps up but he's not worrying about that right now. "Every time we've encountered a challenge, we've been shown the path around," he said. "We'll be taken care of."